Float through the best day of your life in this romantic A-line gown. 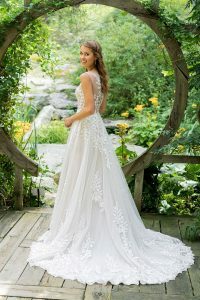 The illusion bodice consists of floral beaded lace appliques that trickle down the tulle skirt. 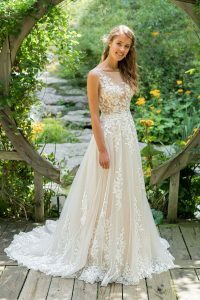 Soft trim lace accents the hem of this wedding dress. Featuring an illusion back with floral lace details and fabric buttons.